On numerous occasions I've been involved in discussions regarding test cases with other folks involved in a software development life cycle where the overall accepted sentiment is that when all test cases are "executed" we are done testing; or testing has not been done unless test cases have been executed. Unfortunately for our field, I've often found myself alone in trying to show that just because you executed 100 test cases does not necessarily mean that you did any testing at all. You could have, but this depends on the person executing the test cases and whether they understand test cases and how to use them in testing. The below presentation I gave at a former employer that had a huge catalog of test cases with detailed steps and was still struggling with product quality. They were hesitant, however, to accept that they weren't really testing when purely executing the test cases. Mainly because they feared that all the effort that went into the creation and maintenance of the test cases would be wasted. In the session I explained to them how they can actually use these test cases to get the maximum return on your investment in the creation of these artifacts. Test cases, since they are designed by subject matter experts, contain all the information that most real world users of your product will need to perform the very same functions; and since they contain detailed steps, are suitable for many applications. Your thoughts, comments are welcomed. I've been absent from blogosphere for the last two months because I've been busy working on a new assignment. This assignment has me knee deep into designing an automated web application framework for a leading SaaS company. One of the first things I identified as being needed for this implementation of my framework (other than the basics: reporting, logging, etc.) was the need to have a group of virtual users (little robots if you will) that will mimic not only real users of the system, but their behaviors as well. A user state system holds the application's user information (e.g. user name, password, email), as well as current user state as it relates to the application under test (e.g. user is busy, paid user, free user, security answers). As an example, lets say you have a system that supports a SaaS for an accounting firm. You have SLA's in place that guarantee certain response times and load times as well as unscheduled down time. In a user state table for this type of system all users will share a common starting state, however this state is only guaranteed when the user record is first added or reset to a default state; from then on each user’s state will be represented in this table. In other words this is a dynamic table constantly being updated / changed by the running test scripts or it may be updated by resetting it to a default state either globally (for all users) or for a particular group of users (i.e. 1 or more users). With a user state system implemented when test scripts execute they request, as part of the test setup, a specific user with a specific set of characteristics from the user state system. The specific set of characteristics would be determined by the features / functions being tested. 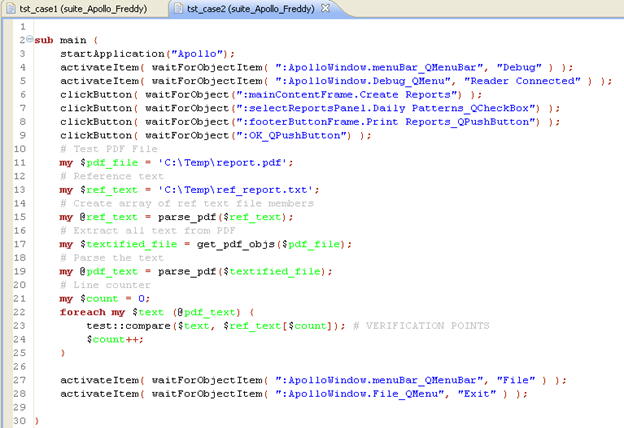 Test scripts then execute using the requested user. For example if you wanted to test invoices being generated properly you would request a user that has the appropriate rights (i.e. is able to add invoices) and that has an account configured with a budget with enough money to satisfy the invoice. Or conversely a user that has an account configured with a budget that does not have enough money to satisfy the invoice. As you can see in the above example you can effectively use a state system to pinpoint specific functionality as required by the test you are designing without the need of building this test data into the test. This level of abstraction gives the test designer, and the automated test system, the flexibility and speed that is gained from using shared virtual users with a known current state. As well, although there is no one size fit all solution when it comes to saving user state, there are some common features that can be shared in any user state system that will be utilized for functional verification in QA or even for TiP (testing in production). I will share some of these in a future post. #stop29119. Campaign? Or a classic example of the "We Have to Do Something" fallacy? There is no denying that there has been a lot of activity regarding ISO29119 since August of this year and it doesn't seem like its going to be dying down anytime soon. The standard has certainly created a rift in the training and consulting space that has aggravated a long time rivalry between two schools of thought. Now, in order to run a successful and, more importantly, profitable business we need to be able to compete and use any tool at our disposal to reach our vision, this includes public debates and functions. One of the things we must keep in mind when talking about standards and certifications is that its a business, most folks know this already but if you don't now you do. And its a business whether you issue a certificate at the end of the training or not, by the way. Its a business with a bottom line just like Sears. Its a business that needs to fight for its existence or fall prey to its competition. Aside from a response from Stuard Reid the WG convenor, the ISO camp has been fairly quiet throughout this debacle. This hasn't been the case for the stop campaign side, however. From them we see statements used like: "where is your skin in the game" or "if the standard is approved all testers will be forced to succumb to and abide by it". You also read some folks say "you'll be forced to produce tons of wasteful documentation" or "before your every move you'll need to get a sign off" when talking or interacting (via social media) with folks that either don't know of the petitions' existence or have decided to abstain from signing it for a variety of different reasons. In following this debate on Twitter, LinkedIn and the web (via individual's blogs). I have noticed a pattern in the rhetoric used by the stop campaign folks which I believe its an almost perfect implementation of the "Scare Tactic"[*1] argument which inevitably leads to a "We Have to Do Something"[*2] fallacy. In other words the standard is going to be so bad that we should all unite and do something, no matter what that something is. Even if the something is just to stop the darn thing. Sounds counter productive doesn't it? Why not offer a real solution rather than a call to arms? This is the part that has me, and a lot of others, baffled a bit. Finally, and for the record once again, I want to be clear that I am not saying that the arguments raised by James Christie based on his own experiences and knowledge is in any way shape or form invalid. I am saying, however, that the ensuing madness does appear to fall within the model of a "Scare Tactic" and "We Have to Do Something" fallacies. I'm not advocating for just silently accepting the standard either, I'm advocating for doing your own research and coming to your own conclusions based on your own independent investigation. Even if one believes the allegations expressed by the supporters of the stop campaign it makes you wonder why the scare tactic? As humans we are thinking creatures. We like to be presented with information and be able to analyze that information and come up with our own conclusions. But when things are framed in a way that it is meant to scare or force people into signing, it makes one wonder if there is anything more to this debate. Anything more than business profit, business market share, and of course the all important human mind share. [*2] We Have to Do Something: The dangerous contemporary fallacy that in moments of crisis one must do something, anything, at once, even if it is an overreaction, is totally ineffective or makes the situation worse, rather than "just sit there doing nothing." (E.g., "Banning air passengers from carrying ham sandwiches onto the plane probably does nothing to deter potential hijackers, but we have to do something to respond to this crisis!") This is a corrupted argument from pathos. Purpose, Mission and Vision may sound like pointy hair mumbo jumbo to you but what if it isn't?. In fact I believe it applies to testing and, specifically to Context Aware Testing. To be context aware means to adapt according to the location, the collection of nearby people, and accessible resources as well as to changes to such things over time. To be a context aware tester means that you have the capabilities to examine the computing and human environments and react to changes to the environments that may affect the product under test. As a contractor she bids for and wins an assignment to test Widget A (an address book application for Windows). During a meeting with the stakeholders you find out this application is for internal use only, their main concern is stability and don't want the app to crash and cause loss of contact information. You start with your purpose. To make sure the contacts application is stable by testing it using real world scenarios. We then lay out what it is that we anticipate when we're done, our vision. This is our definition of done. In this case we anticipate application stability. Next we state the mission. How are we going to accomplish our goal of verifying the state of the application stability. Load testing, stress testing, volume testing. By defining your purpose, mission and vision before starting your testing project (no matter how small) you'd have given yourself a road map as well as a set of constraints to wrap around your testing effort to help keep you focused on the things that matter most (i.e. what's important). Once you start working, this is also a great way to gauge if what you are being asked to do now (an interruption) interferes with or contradicts any of the Test Pacts you are currently working on. In nutshell Test Pacts encapsulate the definition of testing for its specific context in the form of purpose, vision and mission. This implies that for a context-aware tester, the definition of testing is not only depending on context, but also possibly different each time. To a context aware tester, purpose (why) is her guide while the mission (how) is what drives her towards the vision (what). This keeps us closely and tightly aligned with, not only the technical aspects, but also the vision, of the stakeholders as captured in the Test Pacts.